iPhone 5 cases with unique and eye-catching musical designs including rainbow music notes, a grunge style electric guitar, a stylish grand piano and an artistic acoustic guitar. Customizable music designs on iPhone 5 cases with piano keys, music notes, flutes and a retro cassette tape. Add your name, initials or even the name of your business to create a case for your iPhone 5 which will stand out in the crowd! 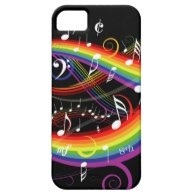 White musical notes dancing on a rainbow of colorful swirls with a black background. This eye-catching iPhone 5 case is perfect for any music lover. "Keep calm and rock on." An elegant design featuring a beautiful shining grand piano on a black background with subtle swirling musical notes. Perfect for the pianist. Perfect for the guitarist, an iPhone 5 case featuring the neck and strings of an acoustic guitar on a blue background with swirls and stars. A stylish iPhone 5 case for the pianist featuring piano keys and golden music notes. Add your name to the gold strip for a personalized phone case. 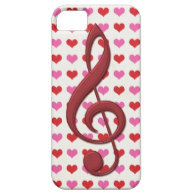 A sweet iPhone 5 case with a large red treble clef on a background of pink and red love hearts. Also available with a pink treble clef with love hearts. A girly design featuring a pattern of flutes, hearts and music notes in pink and brown. Add the name of the flutist to this sweet iPhone 5 case. An iPhone 5 case which looks like a retro red cassette tape from the 1980s. Customize it to create a personalized case. Other colors available. From fashionable and stylish to colorful and eye-catching, these music themed iPhone 5 cases come in a range of styles, including cases from Casemate, Case Savvy and Skinit. Vintage, grunge, modern and classical style designs featuring musical instruments and musical notes for the musician or music lover.